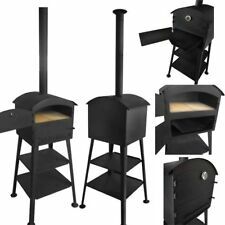 Wood or Gas fired pizza oven - Accessories included. Glass door. Red arch. Arch: High alumina brick. The entire oven is handmade with pure refractory mortar resisting temperatures of 3000 F / 1648 C. Gas burner ready: Prepared to receive a gas burner. Insulated mushroom plug included for exclusive wood use. Firebrick inside the oven. Material: Stainless Steel #430. Wood Fired Pizza Oven • DIY Outdoor Fireplace - Get Both w/ a Wood Burning Oven! When you're ready to build a low-cost, yet highly functional wood fired outdoor pizza oven, look no further than the Mattone Barile foam DIY pizza oven form! ● A great bread and pizza oven for smaller families. 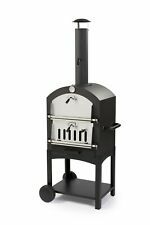 New XL Size Wood Fired Outdoor Stainless Steel Pizza Oven BBQ Grill 44" Wide! 100% New In Box! Latest XL size wood fired pizza oven. We are also including free accessories: Wire brush / broom to keep the inside clean, large pizza peel (large spatula), and outdoor waterproof cover. This is a perfect oven for a pizza trailer! Just mount it and do parties, festivals, shows etc., no rust, no cracks! One of the best deals we have, you will never find a wood fired oven of matching size for a similar price! Why do you love our wood-fired pizza ovens?. We do have ovens available for DIY projects. Pizza in 90 seconds. Assembled ovens and accessories available. be hot when the oven is fired. Use caution when cooking with a wood-fired oven. Cooking area 545 square inches - FREE Shipping! Wood Fired Pizza Oven • Outdoor Oven - Build a Long-Lasting Backyard Pizza Oven! 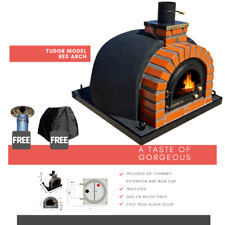 DIY Pizza Oven • Pizza Oven Kit - Save $1000's on your Wood Fired Pizza Oven! Do you want to know how to build a pizza oven?. Our highly detailed DIY pizza oven and brick pizza oven base Installation Instructions (with Materials Lists) can help anyone build an amazing outdoor pizza oven with heat-retaining ceramic fiber blanket. Brunello ROSSO. Portable Wood Fired Pizza Oven. Large cooking space for pizza, bread and so much more. Portable - moves with ease on 4 sturdy casters. Red heat shield. Overall weight: 308lbs. Cooks pizzas in as little as 4 minutes. The Forno Allegro Nonno Lillo is the ideal choice of wood fired oven for anyone venturing into the world of outdoor cooking with wood fired ovens. Its smaller size makes managing the fire and the ambient temperature a much simpler task allowing you to concentrate on cooking delicious food. Harder, heavier wood species generally burn hotter and longer. Latest wood fired pizza oven. 100% New In Box! Large pizza peel (large spatula). Oven is Double Walled filled with 1 layer refractory insulation blanket insulation in between. Harder, heavier wood species generally burn hotter and longer. Latest XL size wood fired pizza oven. 100% New In Box! Large pizza peel (large spatula). Oven is Double Walled filled with 1 layer refractory insulation blanket insulation in between. Replicate a traditional wood-burning pizza oven using your charcoal grill. The PizzaQue Deluxe Kettle Grill Pizza Kit converts your grill into the perfect pizza oven in just minutes. The kit will allow your grill to reach cooking temperatures up to 900F. Wood Fired Oven • Outdoor Pizza Oven - Build a Pizza Oven in 90 minutes! 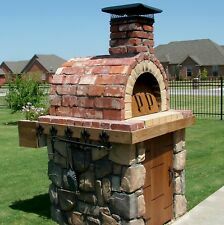 Want to build a small wood fired outdoor pizza oven but don't have any masonry skills?. No Problem! If you can make brownies, you can make the Cortile Barile pizza oven! Simply mix 3 ingredients, pour them into the BrickWood Ovens foam Cortile Barile pizza oven molds and let bake.err. Outdoor Pizza Oven • Wood Fired Oven - Your Outdoor Brick Pizza Oven Awaits! ● Works with any color of firebrick. When you're ready to build a low-cost, yet highly functional wood fired outdoor pizza oven, look no further than the Mattone Barile foam DIY pizza oven form! Mortar firebrick into place at the rear of the oven and build the chimney (3 rows high). Indoor and outdoor wood fired pizza oven with high strength refractory bricks hob (floor). The high efficiency has allowed a reduction of the size, making it compact and convenient maintaining all the qualities of a bigger and bulkier masonry wood fired oven. How To Build A Brick Pizza Oven • How To Build A Wood Fired Pizza Oven - PLANS! ● Cooks faster and hotter than firebrick models. Want to build a small wood fired outdoor pizza oven but don't have any masonry skills?. No Problem! If you can make brownies, you can make the Cortile Barile pizza oven! 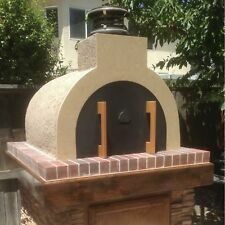 This Artisan wood fired oven, is hand made brick by brick, and it is made in the United States. The floor is high density fire brick also. Oven size Oven base slab: 45" x 38".